He woke up Wednesday with a fever. I made an appointment and brought him in - to find out his ear infection (most likely) never went away and he needs to go on a different medication. But this is the first time I've had to deal with a fever. No fun. Limp, lethargic, moaning little boy with his head on my shoulder day and night. Even Children's Motrin isn't touching this thing. Poor little man. The only thing that helps? Freeze Pops with Pedialyte! No joke! I had no idea they made these. When I was little and was sick, my mom used to buy me popsicles. That helped replace some of the fluid lost. Years later, they came out with this Pedialyte stuff that helps with the electrolytes and other stuff lost while you are sick. NOW they combine them! Spunky Baby won't touch yogurt, crackers, or fruit. But he will eat his pops and reduce his fever. YIPPEE! 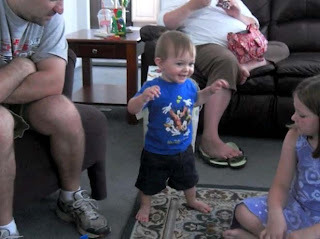 Where were you when your baby took his/her first steps? Holding out your arms waiting for him to fall into them in a fit of giggles? Clapping with her as she smiles and holds her head up proud as a peacock? I was in Manhattan. Five hours from my son. At least I think I was. I'm not sure. I mean, I know where I was today, but I'm not sure they really were his first steps. So, I have to ask my mom friends: what, exactly, qualifies as first steps? One? Two? Three? Across the room? To an object? 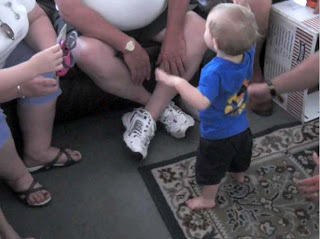 Spunky Baby took his first real step on Thursday, July 10th. One step. Then, boom, down on the diaper. But a major first step! Then this weekend, he stood up on his own - without holding onto anything - for longer than he ever had before - maybe 30 or 45 seconds total. Yesterday we had a house full of guests, so distractions were all around. He literally had 8 adults and 2 kids cheering him on as he stood there (see videos below) and took not one but TWO steps! Is that considered walking? If so, sweet! I was there and I even got it on camera. This morning I woke up at 4:00 and was on a 6:30 flight to LaGuardia - NYC. We had meetings all day for work. Spunky Daddy is doing a great job playing Mr. Mom while I am away (I'll be home tomorrow night). It's my first time away from Spunky Baby overnight (aside from the night me and Spunky Daddy left him and went out to dinner...) and the first time that Spunky Daddy is in charge for a full 48 hours. He called as I was driving out of the city: Spunky Baby took three steps tonight. My little man is growing up. So, all you parents out there...what did you use as the benchmark for "first steps" in the baby book? I'm curious to see if I was there and didn't pay much attention (one step), there and took video (two steps) or hundreds of miles away (three steps).